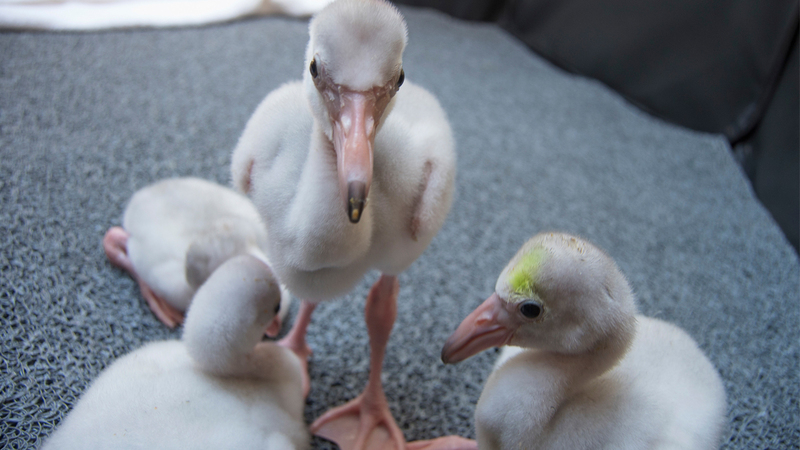 SACRAMENTO, Calif. -- Five baby flamingos have hatched at a California zoo after an 18-year drought of the spindly-legged chicks. The Sacramento Bee reports Thursday that the eggs hatched between June 28 and July 18. Sacramento Zoo spokeswoman Tonja Candelaria said the birds are finicky and that a number of factors may have resulted in the baby gap and sudden laying of eggs this season. The American flamingo is native to South America and the Caribbean. Adult flamingos are pink, but the chicks are downy white. Pigments in their aquatic food give the birds their pink coloration. The chicks need daily walks to strengthen their legs. Eventually, they will join the others at the zoo lake, which is already home to 36 adult American flamingos. The Sacramento Zoo has had American flamingos since 1966.